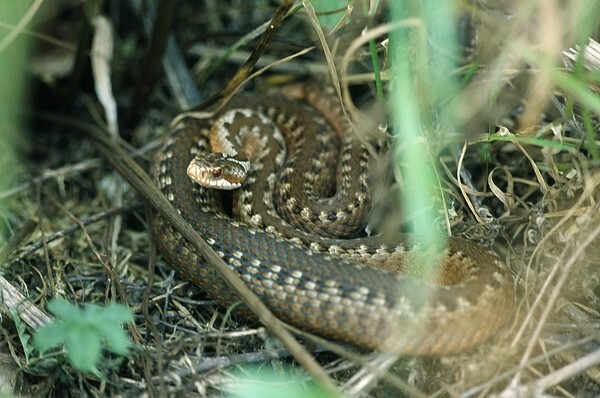 The protected vipers often cause heated debates. August is the month of family increase and it should be stated at once that researchers maintain that vipers do not reproduce every year. And there aren’t really such great numbers of them in Estonia. The viper give birth to living young – the young vipers develop in the eggs and hatch already in the body of the female. At birth the snakes are just over fifteen centimetres long. The first shedding of skin begins within a few hours and it takes place close to the place of birth. After the skin change the young vipers crawl apart to start life on their own. In good weather they begin to feed on insects (after all it is the peak time for grasshoppers and crickets), in addition beetles; butterfly caterpillars, ants, slugs or earthworms are less often hunted. In case of rain or bad weather they shelter and live on reserves stored in the organism. The little vipers should not be handled, they hiss, bite and try to inject venom, because the venom glands are already developed. They prepare for wintering towards the end of September or beginning of October as do the fully-grown vipers. Until then they shed their skin at least twice. The body grows and needs a fitting cover. Interesting reptiles and not nearly as aggressive as they are made out to be. Medical statistics state that on average over the years bites happen because of carelessness, and the number has not increased.